This post was co-written with Jingjing Qian, NRDC's China Program Director. Chinese and American leaders met in Los Angeles to engage city, state, municipal, private-sector, and NGO partners on addressing climate change. Nine collaborative documents were signed during the Summit by U.S. and Chinese cities and provinces, and between various business and academic players of the two countries, showing that both countries are taking ambitious actions to address climate change. The U.S. - China Climate Leaders Declaration was signed by cities and states attending the Summit, including 10 cities and one province from the China side and the U.S. cities of Atlanta, Boston, Los Angeles, Connecticut, Portland(OR), Seattle, Houston, Salt Lake City, Des Moines, Carmel (IN), Pinecrest (FL) Miami-Dade County, Boston, San Francisco, and Washington, D.C. The Declaration includes several new initiatives. An especially encouraging and significant one is the establishment of an Alliance of Peaking Pioneer Cities (APPC). The APPC establishes peak years for carbon dioxide emissions that are earlier than China's national goal to peak around 2030. These progressive cities are setting inspiring examples to lead others in China to make similar ambitious commitments. 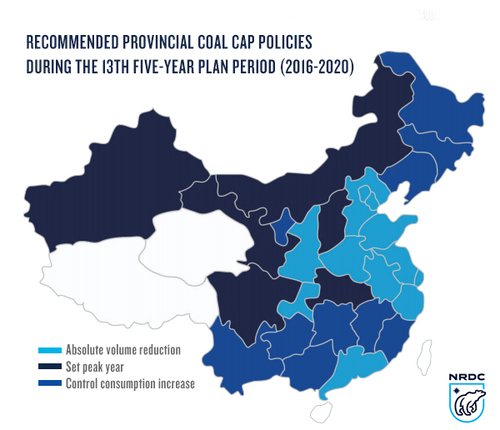 NRDC's China Coal Cap Project has been promoting the efforts of China's cities and provinces to set coal use caps to reduce the use of coal. We commend the Alliance of Peaking Pioneer Cities for showing leadership. Beijing and Guangzhou, cities with a population of 22 million and 13 million people respectively, have committed to peaking carbon dioxide emissions by around 2020, a full decade before China's national target. The cities and provinces in China that are signing onto this Declaration account for roughly 1.2 Gigatons of carbon dioxide emissions annually. This is about a quarter of China's urban emissions. More importantly, this is the same level of carbon dioxide emissions as the entirety of Japan or Brazil. The APPC is a major undertaking and a sign that cities and provinces in both places are making serious efforts to cut emissions. This will also have the added benefit of reducing air pollution in Chinese cities. Two new cities, Guangzhou and Nanjing, have joined the C40 Cities Climate Leadership group, alongside Beijing, Hong Kong, Shanghai, Shenzhen, and Wuhan. These seven cities that have committed to serious emissions reductions represent about 90 million people, equal to over a quarter of the total U.S. population. Los Angeles and Zhenjiang have signed the Subnational Global Climate Leadership Memorandum of Understanding, committing to reduce greenhouse gas emissions 80 to 95 percent below 1990 levels by 2050 or a per capita emissions target of less than 2 metric tons by 2050. As Barbara Finamore highlighted in July, China's climate commitments will require the country to make very significant changes to its emissions trajectory - including adding non-fossil power equivalent to the entire U.S. power generating capacity by 2030. China's emissions will peak at a much lower GDP than that of developed countries, and at a lower per capita level of emissions as well. The annual emissions reductions rates will be quite high compared, demonstrating a serious commitment to action. The summit this week is yet another demonstration that the U.S. and China are both moving in parallel to address climate change through concrete action and local implementation. The full list of initiatives from this week's summit in Los Angeles can be found in the White House announcement. They cover a range of areas including carbon markets, zero-emission vehicles, smart grid development, distributed renewable energy, green buildings, and much more. By the time leaders convene next summer in Beijing for the next major Strategic and Economic Dialogue, we hope that concrete results from these collaborations will be shared.